Where Your Donations Are Invested Right Now (2018/2019)! 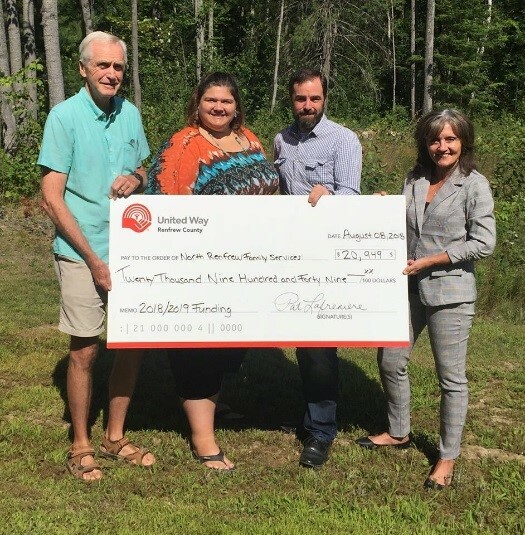 Arnprior Family Pre-School – Emergency basic needs fund to support young families and mental health support skill training for staff. Boys & Girls Club of Pembroke – A variety of programs essential to promote learning and development: Clubhouse after School Program; Teens in the Kitchen and Teen Rec Nights; Critical Hours program for vulnerable youth. To work with engaged youth on leadership skill training and provide them direction on mentoring other youth in vulnerable situations. grievance counselling to support family members for a quicker recovery from the grieving process. Family and Children’s Services of Renfrew County – Safe Shelter for Youth program for youth who are at risk of homelessness. ELEVATE – Promotion of services and events to area youth and agencies that support youth: Free Fitness facility, cooking classes, mentoring and support. North Renfrew Family Services – Mental health and social programs as well as the Successful Relationship Building program. The Grind Coffee House - Operation of a 3-bed homeless shelter for adults in Pembroke and provide with agencies mental health and social programs to help clients move towards wellness. Petawawa Military Family Resource Centre – Pre & post-natal nutrition programs and family support to military families. Galilee Centre – Monthly breakfast for seniors to promote social interaction and decrease isolation. Dial 211 - Free information service offering direction to individiuals seeking help with social/ health issues. Details here.